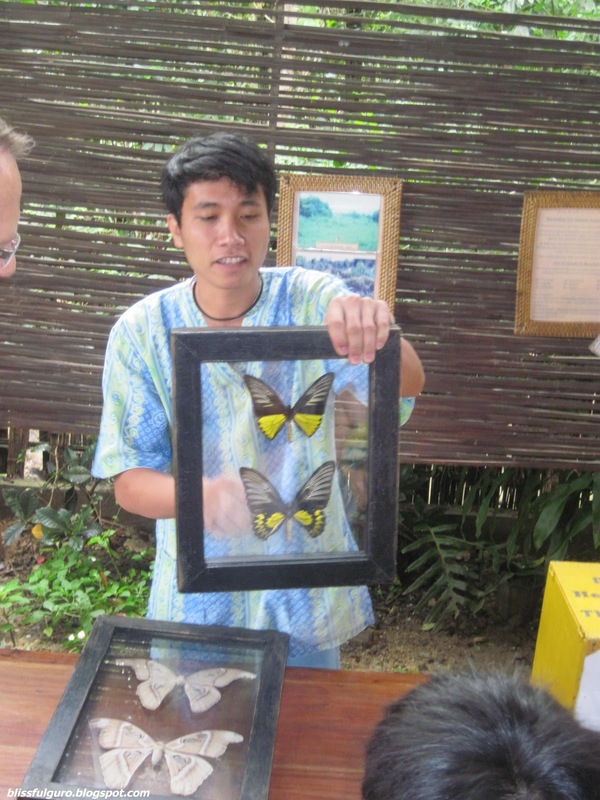 A first of its kind in Bohol, the Simply Butterflies Conservation Center aims to protect the natural environment of the butterflies and to raise the butterfly population in Bohol. It is located in the town of Bilar. 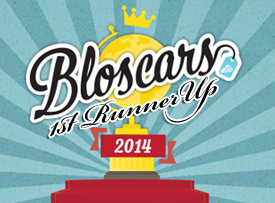 It is our second stop in our 12-spots tour right after the Chocolate Hills. We still can't get over our Chocolate Hills experience while kuya tatsky (our tour guide) was sharing some research about it. And then he said that our next stop will be the Butterfly Center. I was like, "Oh...okai". I'm not really into animals or insects hence the reaction. We paid 20 pesos each for the entrance fee. They will tell you that you should wait for a guide. A guide will gather a few people before he starts. Our group were like 12 persons with two foreigners. The guide will first discuss the difference between a moth and a butterfly. He will show some preserved butterflies. He also showed us a "gay" butterfly- a butterfly with different wing color on each side. 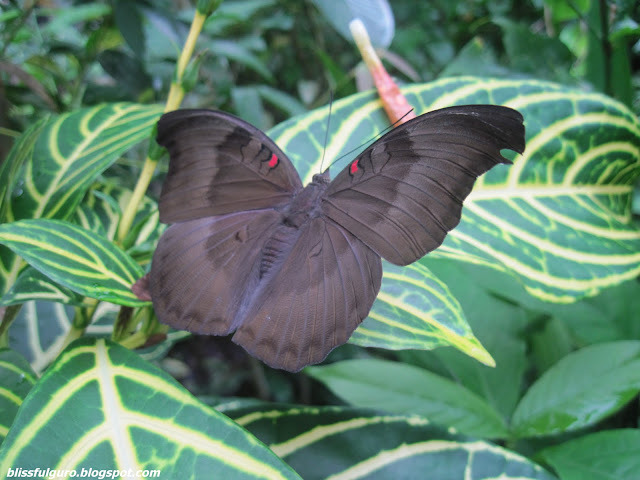 This is a defect because butterflies only attract and mate with their own species (same color and all). After a quick overview, he then showed us the life cycle of a butterfly. From a diagram to a real one. 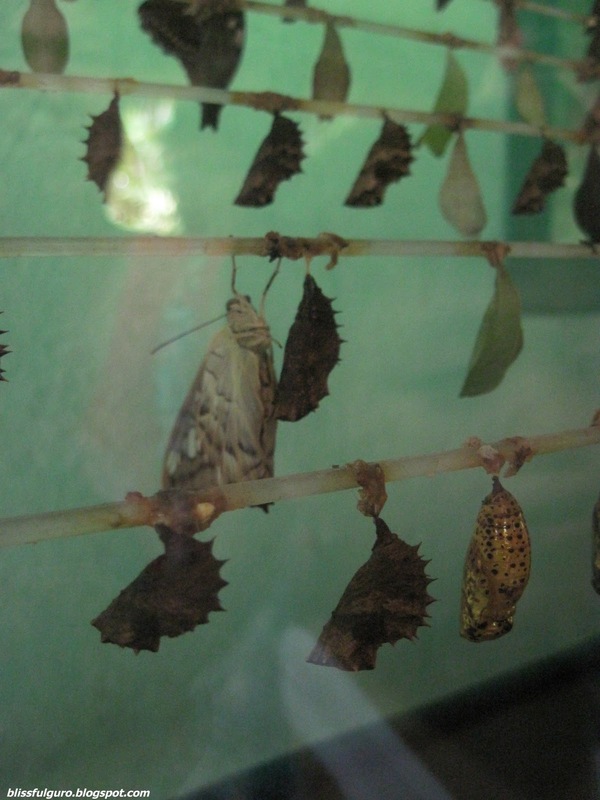 From egg to caterpillar to pupa to a full bloom butterfly. Their life cycle will last for up to 19 days. 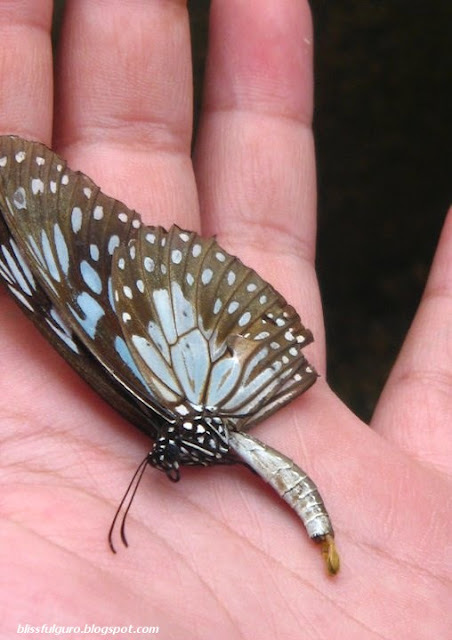 If you're lucky, just like us, you might see a butterfly hatching and on its way out from its cocoon. After the "theoretical" part, you will then be ushered to the conservation area. The part where butterflies are enclosed in a big net to protect and preserve them. He showed us how butterflies "play dead" so as to defend themselves from predators, like humans. 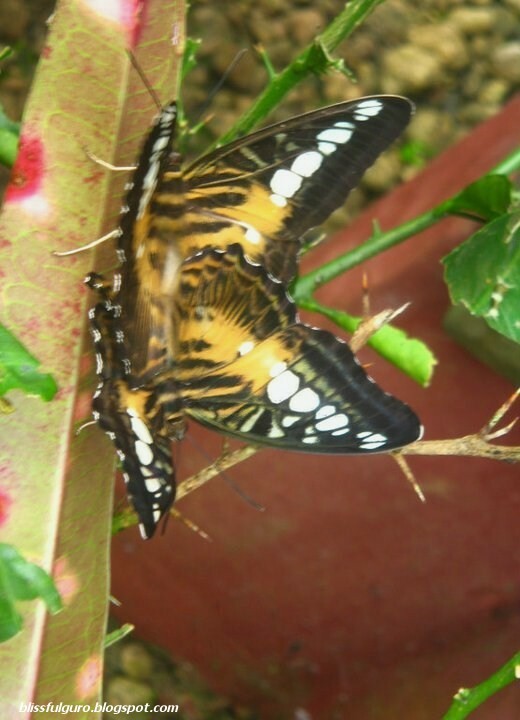 He also showed two butterflies mating. The female butterfly is always on top and she carries the male butterfly while they are mating. This would last up to 24hours straight. Whoa! that's long! They also have an open area where the butterflies fly freely. On this part, the tour will end. You can explore the center by yourself and interact with the butterflies and their environment. There's also a cafe and an ice cream bar there. And also a souvenir shop. We were lucky to see many butterflies inspite of the weather. 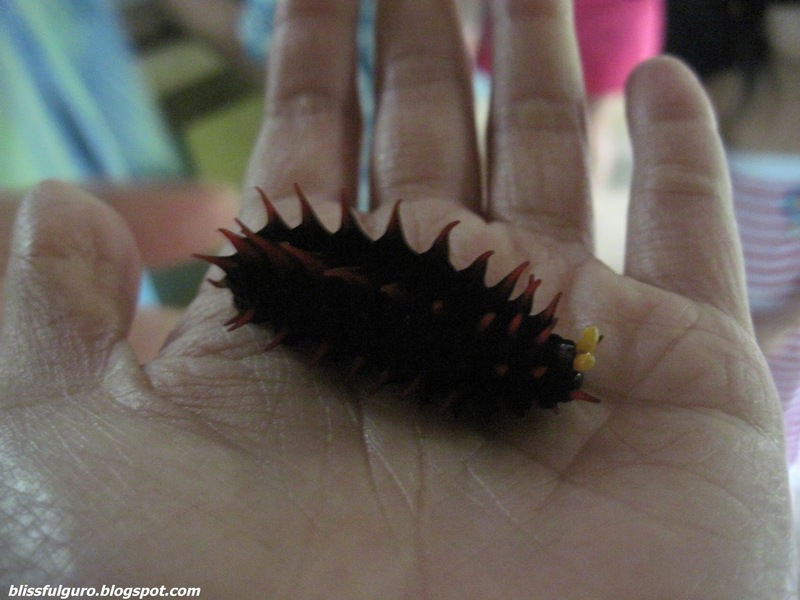 The guide said that they come out if its really sunny and they tend to hide when its cold and raining, just like humans. 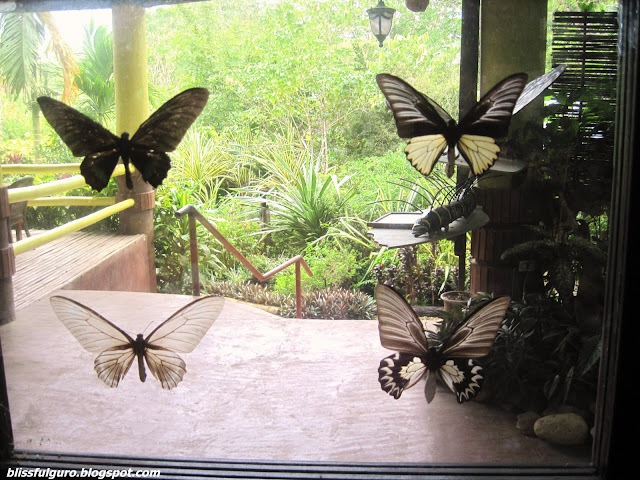 So if you happen to be in Bohol, don't skip the Simply Butterflies Conservation Center. There's so much to learn from this center.